Thanks so much to my customers for sending me photos of their sinks. 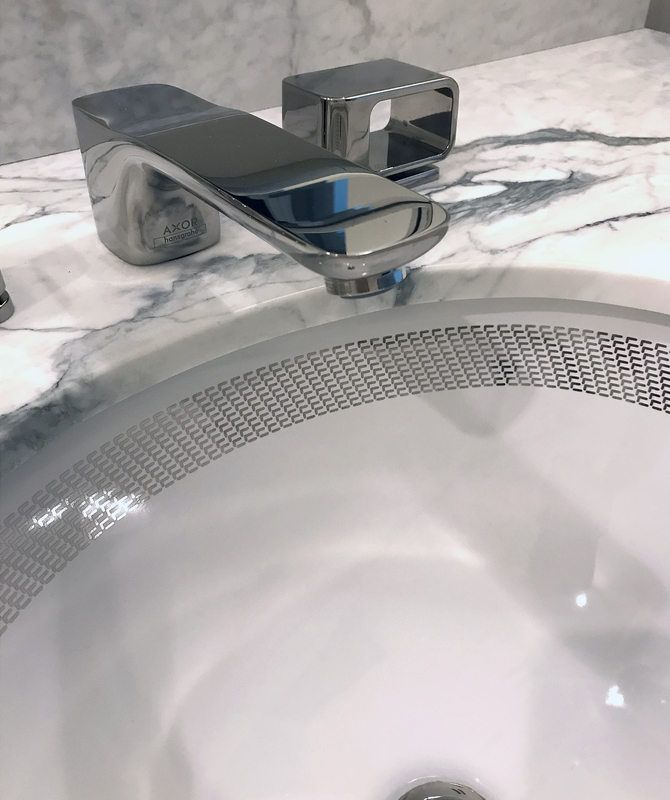 This post features a modern powder room with a white Carrera marble counter, stylish chrome faucets and our Chain Maille border design in platinum painted on the sink. It’s just one of the many Gold & Platinum Border designs we offer, all available for sale on our website, decoratedbathroom.com. Close-up of the geometric pattern border on the basin. The sink looks really good in this bathroom. The whole thing works great, the border on the sink, the colors, the super-cool faucets, they probably weren’t cheap, the white marble counter and backsplash. I would like this as my powder room. Of course I could get the sink pretty reasonably, the rest of the stuff, not sure I would have the budget. My master bathroom is half done at the moment, I’ve spent a fortune already and it still need another $3500 to finish the job off. It’s functional but still requires a shower stall and some tiles. I take baths, the tub is new and wonderful and works perfect for me. Soon. I live in Las Vegas and the housing market has been going up and as soon as my 16-year-old-70 pound dog crosses the rainbow bridge, I’m leaving town. I’m from Toronto, I don’t cope well with 110 degree heat and rocks everywhere. I’m sick of them. I want flowers, like on the sinks! Metallic Platinum border painted on a white, 17 x 14″ undermount basin. Here is the actual sink from the website. 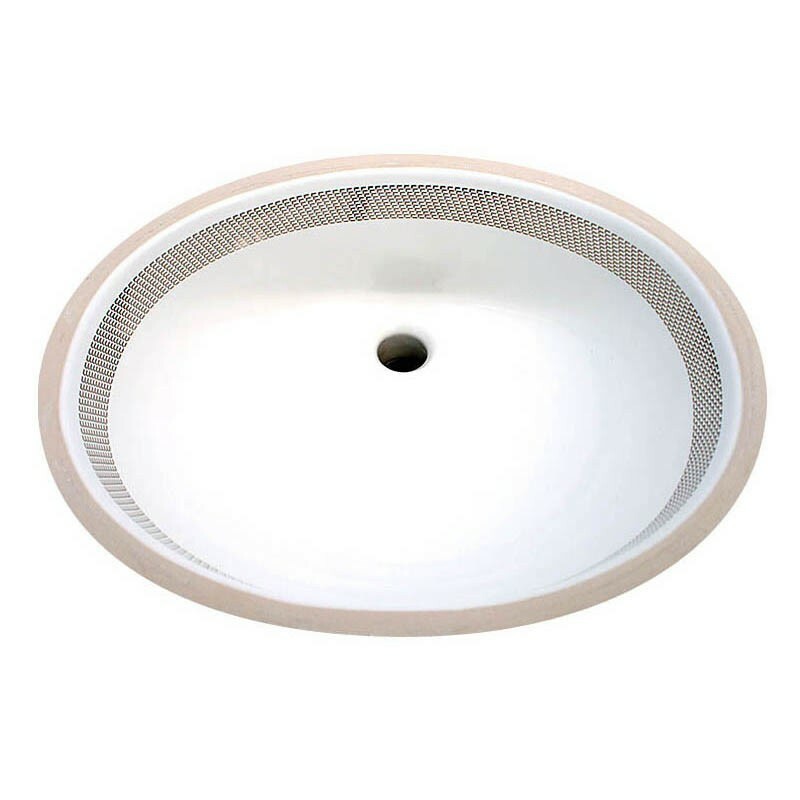 It’s a standard 17 x 14″ undermount, the most popular size for a bathroom basin, and is installed under the counter. 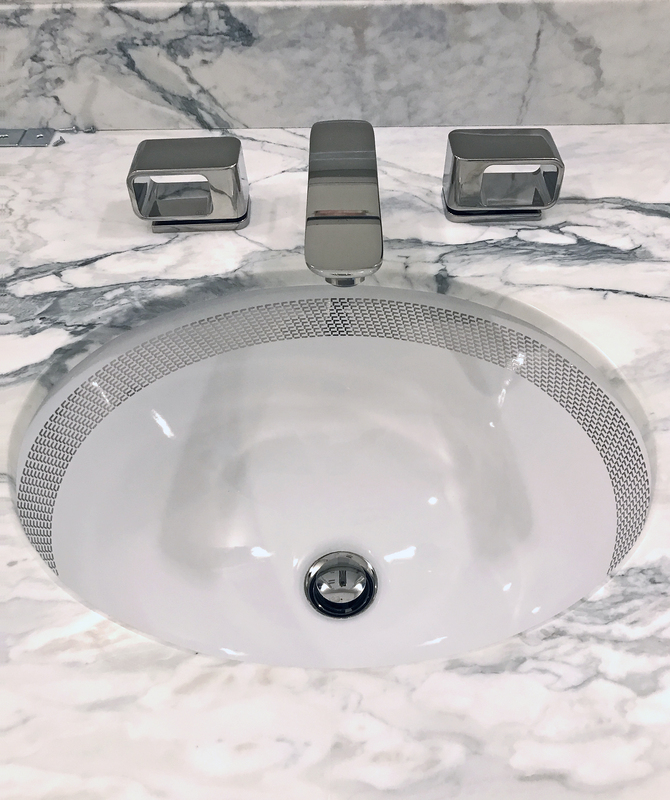 The design is available in gold or platinum, and looks great with any marble or granite, quartz of course and any type of vanity. The gold looks a little more traditional than the platinum but I prefer the silver tones myself, matches the faucets and chrome faucets are much cheaper than gold ones! If you want everything to match in your bathroom, everything else comes in chrome, like toilet flush handles, the gold ones are expensive. White marble bathroom featuring the Chain Maille Border on the sink. 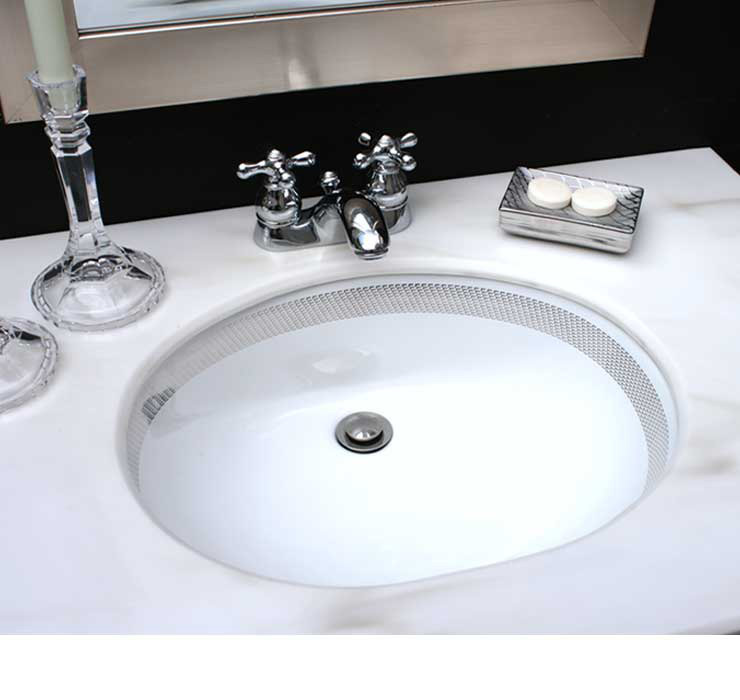 This really is a great shot of the marble counter in the bathroom featuring our painted platinum border bathroom sink. Made by me, Lynne Sands, all by myself, here in horrible Henderson, NV. It is pretty nice in the winter, if I hadn’t already been here in Rock land for the last 15 years, it would be a great place to retire. But, I won’t be retiring so no need to worry about that, and as I was saying, I would like to see some flowers, green trees, rivers, lakes, even snow and of course rain, something you come to love when you live in the desert. Ok back to the sinks. It is good for sink manufacturing, because ceramics like a dry environment but in the summer, I can only run the kilns at night because it gets crazy hot in the garage. Too hot. Here’s another bathroom, similar look with the same vitreous china sink, the Chain Maille Border in platinum in a black bathroom with white marble counter. Since I’m pouring my heart out in this post, this is a totally faked up bathroom shot. In the courtyard at my former house, if you stepped back you would see the pool and all the lawn furniture and stuff. The light was pretty good. If you really zoom in on the faucet or drain you might see a reflection of the house, or actually I think I recognize the outline of the trees in the yard. Now I’ve got a whole room for fake bathroom set-ups and professional lighting so I can do it inside. Slightly more practical and you don’t have to clean it all up every time. I am in a writing mood this morning, better keep at it with blog posts!